Ahhh, the holidays! I just love celebrating. It’s also so fun to create with food and make new yummy desserts and drinks to enjoy with family and friends. When the weather starts turning colder, we stock up on Swiss Miss Hot Cocoa as our go-to evening drink. My only drawback is that I don’t really care for hot drinks. Instead, I make Frozen Hot Cocoa! Since coming up with new recipes is one of my most favorite pastimes, I spent some time in the kitchen recently to see what I could create with Swiss Miss hot cocoa. After a grocery shopping trip to Kroger, I came home with all of the necessary supplies to whip up a new chocolate treat. With a little tweaking, I am happy with the results. My family is pretty happy as well. They do suffer so for my blog, don’t they?! Are you a Kroger loyalty shopper? Through 11/24/16, use your shopper card at Kroger to save even more! 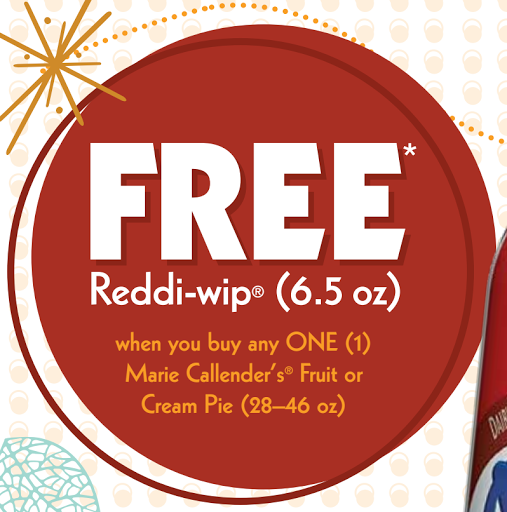 You’ll receive a FREE Reddi-wip® (6.5 oz) when you buy one Marie Callender’s Fruit or Cream Pie. The discount is automatically applied at the register with qualifying purchase. Must use shopper card with purchase. Participating locations only. Offer expires 11/24/16. See store for additional details. Limit 1 per transaction. Triple Chocolate Hot Cocoa Mini Cakes! These started out as muffins, but once we cut one open, we determined that they are more like a mini cake, so that’s what we’ve dubbed these chocolatey cakes of goodness. I packed as much chocolate as I could into these mini cakes, while still retaining the hot cocoa flavor. Swiss Miss hot cocoa adds such a unique flavor to this recipe. Top these mini cakes with Reddi-wip®, my first choice since it’s made from real cream. Add some chocolate syrup if you desire a bit more chocolate! Since we had the Swiss Miss out and were in the creative mood, we mixed up Frozen Hot Cocoas to serve with our mini cakes. You could certainly drink the hot cocoa, well, hot, but I like this frozen drink best! The frozen hot cocoa uses only 5 ingredients and is super simple to make! Unless you have a high-powered blender, use chopped ice to make this frozen drink. The large ice cubes are a bit difficult to chop fine enough to “freeze” the drink. To quickly chop ice, I add ice cubes to a large zip-top bag, then use a meat tenderizer to chop it up. You don’t need to go too small with the ice but chop it well. I use half & half instead of milk for this drink. This makes the drink thicker and richer. Add all of the ingredients to a blender and whip it up. Take care not to blend too long as you want tiny bits of ice to remain, making this a frozen drink. Make your holidays and special occasions a little easier! Look for Marie Callender’s Dessert Pies and Reddi-wip® products in a Kroger or Kroger banner store such as Dillons, King Soopers, Frys, Fred Myer, Ralphs, Food 4 Less, QFC, Smiths, and Harris Teeter near you. Don’t forget your extra savings at Kroger! Prepare muffin tins by spraying with non-stick spray OR use muffin liners. In the bowl of an electric mixer, add eggs and butter. Mix thoroughly. Add sour cream and coconut oil, mix to combine. Mix in dry ingredients to thoroughly combine. Stir in ¾ cup chocolate chips. Scoop mixture into muffin tins. Add chocolate chips to top of mixture. Bake 20 minutes or until baked through. Take care not to overbake. Remove from oven, allow to sit in tins for 5 minutes before removing to a wire rack to cool thoroughly. Serve with Reddi-wip whipped topping and chocolate syrup, if desired. Mix to combine, taking care not to crush the ice too fine. The drink should have small ice pieces in it.